Cllr Dean Cohen with Mayor of Barnet Brian Salinger, opening the new garden. 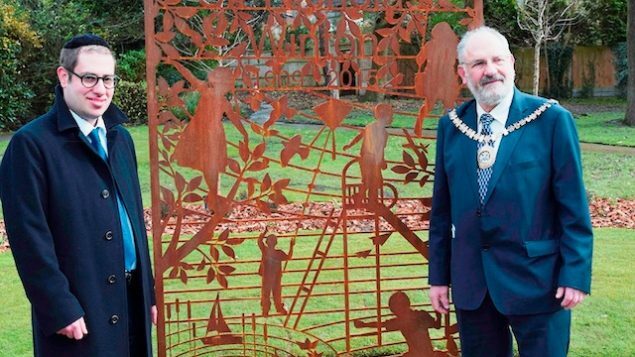 A new garden in memory of the British humanitarian who saved hundreds of Jewish children from Czechoslovakia before the Second World War was opened in Golders Green on Tuesday. Mayor of Barnet Brian Salinger and Cllr Dean Cohen Chair of the Council’s Environment Committee cut the ribbon in a ceremony to open a memorial garden for Sir Nicholas Winton at Princes Park in Golders Green. Winton was a young investment banker when, over Christmas 1938, he went to see what help he could offer in Prague, rather than go skiing as planned. Over the next nine months he organised the evacuation of 669 children, most Jewish, in an operation later known as the Czech Kindertransport, with Winton finding homes for the children and arranging for their safe passage to Britain. Pupils from Menorah Primary School and Wessex Gardens Primary School joined the ceremony, which Salinger said was “particularly fitting,” adding that he hoped children “can be inspired by this man’s great heroism”. Cohen said Sir Nicholas “was a man of extreme courage who displayed immense bravery saving hundreds of Jewish children… I am proud that the legacy of such an incredible humanitarian has been marked in this special way”.